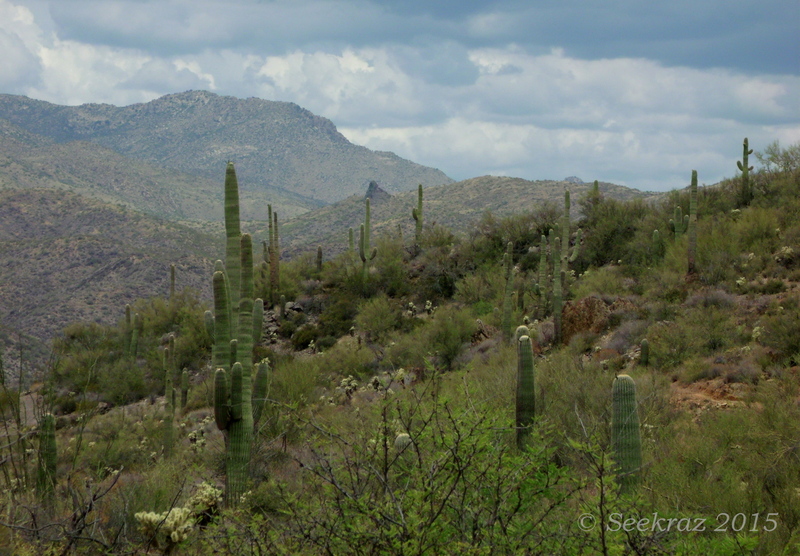 The western edge of metropolitan Phoenix is covered in various agricultural plots, fields and fields of sundry growing things, from acres of palm trees, salt-cedar trees, wheat (or some other grain), corn, cotton, carrots (recently harvested), onions, alfalfa…. ….rows(es) and rows(es) of roses…. A wrong turn last Sunday brought me to this bit of sweet serendipity….the northeast corner of Reems and Olive for any local readers…. I slowed down a bit to admire the fields, clouds, and the bright sky, and knew that I had to return with my camera in quick minutes to capture what I had hoped would be some amazing photographs. By the time I did return, maybe 15-20 minutes later, the clouds were piling closer to one another and the blue patches of sky were becoming fewer and fewer…and then blue was gray and the light was good for some photos and not for others. I’m not sure how long I was actually out there, stepping gently between the rows, crouching among the thorns, and muddying my shoes a bit in the process…. …but I left with over 100 photos…. ….and managed to whittle the prizes down to these few…. As always….thank you for visiting…. Just south of the Glen Canyon Dam in Page, Arizona, there is a scenic overlook that permits visitors to have a fantastic view of the river below, as it has carved its way through the red/peach sandstone that used to be an ocean floor in eons past. One can step past the protective guard rail and approach the literal edge of the earth, cliff-wise, and peer out and into the river’s chasm that is several hundred feet below. 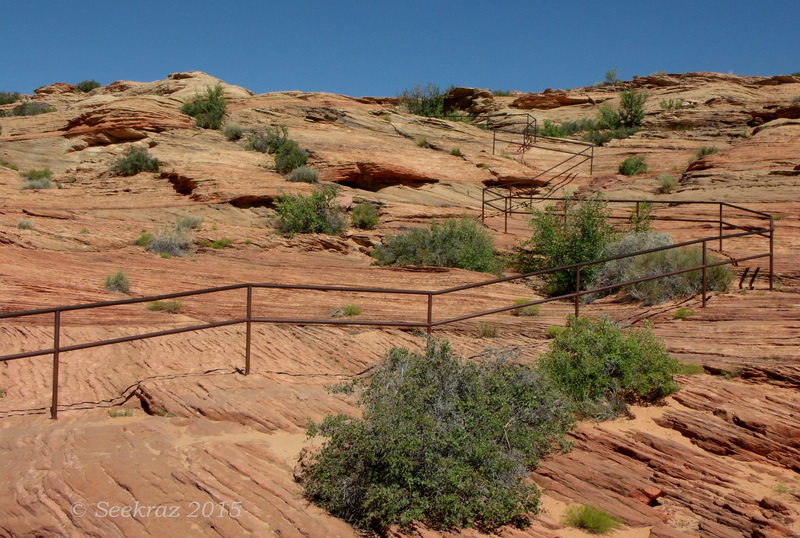 The lines of the handrails and the ridges and scoops of the sandstone caught my eye when I turned to look back…a curious placement of such a thing when viewed out of context, but knowing where and why brings its meaning. For those who are used to walking on uneven terrain, the walk down and back is not difficult, but for others, the railing is…there if you need it. It doesn’t do it justice, of course, but this is a tiny representation of the almost six-hundred images that I made during my six hours in the canyon about a month ago. Following the pictures in their presentation, we’re essentially going from the beginning to the end…and anyone who’s taken a four to five mile hike in one direction, knows that things can often look so different on the way back to the starting place…lighting, moisture in the morning air, and even the tiredness and level of attention paid by the hiker/photographer can determine how and what things are seen. I also made several photos of the multitude of wildflowers that I encountered on the trail, but will include them in yet another post of the area. Please remember that you can click on any photo in the gallery to be taken to a slide show that presents each image in a larger format. waylaid by a field of flowers…. The last eleven miles of the trip to Sycamore Canyon were on a dirt road that started out good and ended up bad…clouds of dust rolled up behind me in the morning light, making a hazy contrail that faded and ran in the rear-view mirror…eight miles to go and I almost didn’t stop….seven miles to go and I couldn’t not-stop. They stretched that far, first thin and then full. I got out of the truck and was surprised at the coolness of the air…and the light perfume that rode on its tiniest breezes. 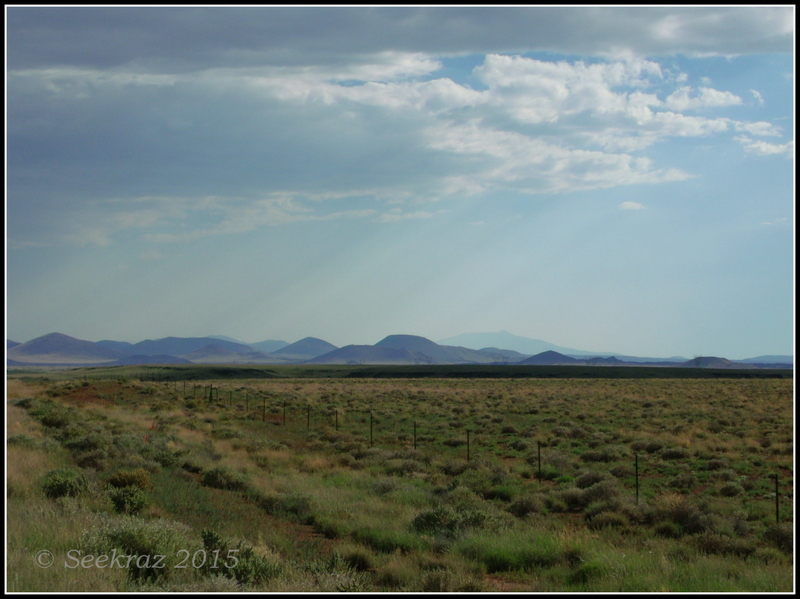 There was a fresh sweetness everywhere…literally surrounding me on this high-desert plain.